Prevent Medicine Abuse by Cleaning Out Your Cabinet | GUIDE, Inc.
Did you know? After alcohol and marijuana, prescription drugs are the most commonly misused substances by Americans ages 14 and older (NIDA). Increases in prescription drug misuse in the last several years are reflected in increased emergency room visits and overdose deaths across the country. The types of prescription medications most frequently misused are opioids (used to treat pain), central nervous system depressants (used to treat anxiety and sleep disorders) and stimulants (used to treat attention-deficit hyperactivity disorder) (NIDA). As attention to this issue grows, another key point to consider is that 2/3 of teens who misused pain relievers report that they got them from family and friends, including their home’s medicine cabinets (SAMHSA). This means that addressing this issue truly needs to start at home, in your own medicine cabinets. Taking inventory of your medicine cabinet and cleaning it out regularly is a powerful prevention tool, especially if you have children. Safe storage and disposal of medications reduce opportunities for easy access and the chance that your medications will be used in ways that are unsafe or illegal. Check the dates. Anything that is expired should be disposed of. Medications may lose their effectiveness after their expiration dates, and some even become toxic. For medications that don’t contain expiration dates, they should be discarded one year after they were purchased. Check the medication for any signs of alteration. Anything that displays signs of changes in color, smell or taste should be disposed of. Ensure all medication is in its original container. If you come across anything that is not in its original container, where you can’t identify what it is, who it belongs to, how to take it and the expiration date, it should be disposed of. In the future, always remember to keep medications in their original containers to ensure safety. Ensure all medications you possess are absolutely necessary. Prescription medications, especially painkillers, should only be kept when they are in use and currently needed. Anything that is left over from a past injury or ailment that is healed should be disposed of. Ensure all medication is stored in a safe place. Medications should be locked away or otherwise inaccessible to children, pets, house guests or even other family members to whom they don’t belong. More information on why this is important can be found here. Medications should also be stored in a cool, dry place, protected from extreme cold, excessive heat, humidity and direct light (the kitchen and bathroom are not ideal locations). The above list has been adapted from National Kidney Foundation, Institute for Safe Medicine Practices and Office of Disease Prevention and Health Promotion. The DEA hosts National Prescription Drug Take Back Days twice a year (in April and October). Take them to a prescription drug disposal drop box. These are dedicated locations that are available in many common areas in your community, such as pharmacies, police stations and some college campuses. Take advantage of this safe and convenient way to get rid of unused, unwanted or expired medications. Start by calling your local pharmacy or police station to see if they have a drop box or know of one nearby. You can also search for CVS or Walgreens locations online. Remove prescription drugs from their original containers. Place the mixture into a disposal container with a lid or a sealable plastic bag. Conceal all personal information from the original container’s prescription label to make it unreadable by covering it with a permanent marker or duct tape, or scratch the label off completely. 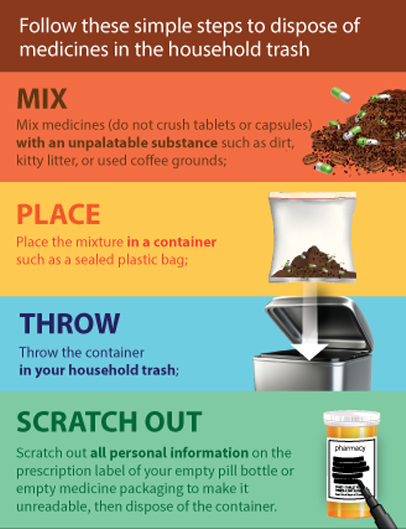 Place the sealed mixture and original drug container in your household trash. Do you have a plan of action for cleaning out your medicine cabinet? Using the tips presented here, you can take the steps today to make your home safer. If you have any questions about cleaning out your medicine cabinet or safe medication disposal, please feel free to contact Kimberly Wilson at kimberly@guideinc.org.